Rising above the prairie in Moorhead, Minnesota one can see the twin peaks of the Hjemkomst Heritage Center as it houses a recreated Viking Age ship and museum of Scandinavian culture. 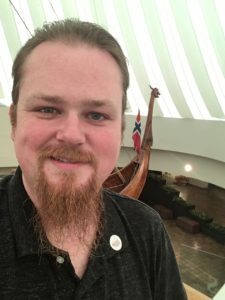 I love to explore the grounds of the center, and made a special visit recently, taking in not only the famed ship, but also a guided tour of the stave church behind the museum! 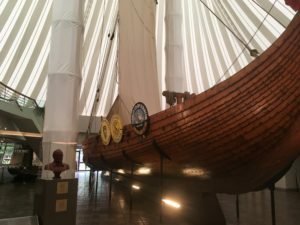 The Hjemkomst Center serves as a museum of Scandinavian heritage on the northern prairie, with the highlight being the famous Hjemkomst ship which was modeled on an actual Viking Age ship uncovered in Norway in 1880. 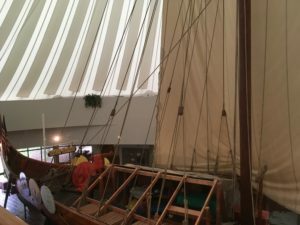 The brainchild of Bob Asp, a local high school guidance counselor, the Hjemkomst’s construction began in 1972, with its first voyage on Lake Superior in 1980. 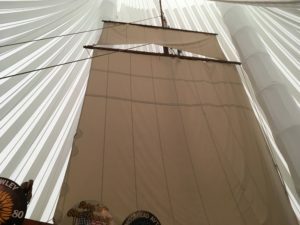 Bob’s true dream was to see his beautiful ship sail to Norway, and so his friends and family came together to realize that dream, and in 1982, 13 crew members began an incredible journey sailing the ship from Duluth, Minnesota to the shores of Bergen, Norway–a voyage of more than 6,000 miles! Upon its arrival in Norway that summer, the Hjemkomst and its crew (which included both Americans and Norwegians) received many joyous welcoming celebrations from the people of that land, many of whom share ancestral connections with a great number of the prairie settlers of modern-day America. 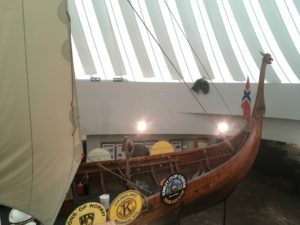 The name “Hjemkomst” means “homecoming” in Norwegian, and after its grand journey to Norway, the ship was brought back “home” to Minnesota where all can view it and read its incredible story in the interpretive center. For those who love detailed facts, brochures at the center state that the ship is 60 feet tall and 76.5 feet long, weighs 16 tons, and carries 32 oars within its 17.5 foot width! 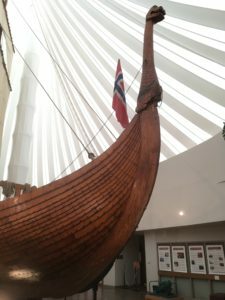 Of course, the viking ship isn’t the only display at the Hjemkomst Center; there are many other displays of Scandinavian heritage, both Viking Age and modern, to be taken in, as well as a fine gift shop and even a cafeteria! 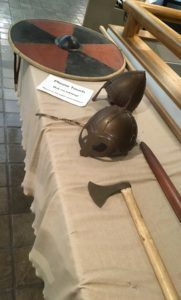 Travel Tip: The Hjemkomst Heritage Center hosts the Midwest Viking Festival each summer. The dates for 2019 are June 21st-22nd, and will include reenactments, artists, traditional Scandinavian cuisine, and much more! In years past I loved the battle reenactments and have savored the chance to once again enjoy food and dishes I once loved in Sweden and Iceland! 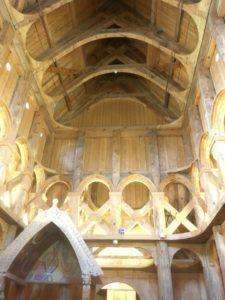 As amazing as the ship inside the center is, my favorite part of visiting the Hjemkomst Center is the incredible stave church which stands on the grounds behind the museum. 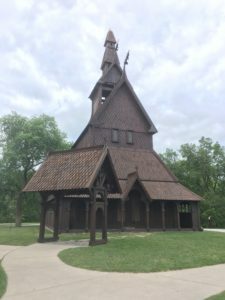 Modeled after the Hopperstad Stave Church in Vik, Norway, the church at the Hjemkomst Center represents the combination of Norse and Christian architecture common in the 12th Century with its vertical wooden beams (or staves) and lack of metal fixtures. This particular building was begun in 1997 and took five years to complete. 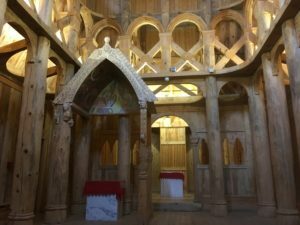 The interior is as ornate as it is simple, with its soaring ceiling and carved Biblical scenes. The exterior of the church features a “cold walkway” or svalgang, and even has a “lepper’s window” through which the quarantined infirm would have made confession and received sacraments in centuries past. 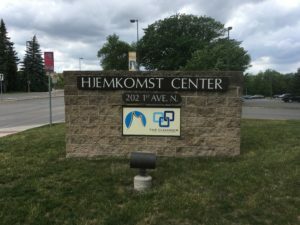 If you go, look for the Hjemkomst Center just over the river from Fargo at 202 1st Ave. North in Moorhead, Minnesota. The Center is open from 9-5 Mon-Sat., and from noon to 5pm on Sundays. It is also open until 8pm on Tuesdays, with the third Tuesday of every month having free admission. Otherwise, the regular admission is $10, with discounts for seniors, college students, and children. 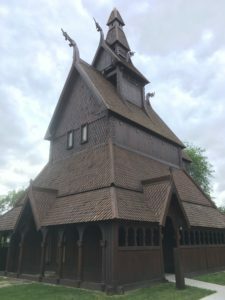 The stave church does close from January to March due to the sometimes harsh Minnesota winters! 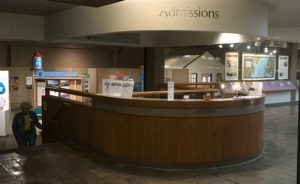 Look for the admissions desk just beyond the gift shop to buy your ticket or to ask any questions of the friendly volunteers who man the station! As a solo-traveler, I enjoy day-trip destinations such as the Hjemkomst Center for their easy access, low admission price, and also for the cultural stimulation. 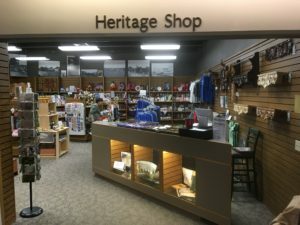 The prairie region of the United States offers many exciting adventures, but every now and then, it’s refreshing to find a spot like this where one can simply enjoy a quiet afternoon and walk away feeling rejuvenated (for another relaxing Moorhead day trip I enjoyed recently, click here). 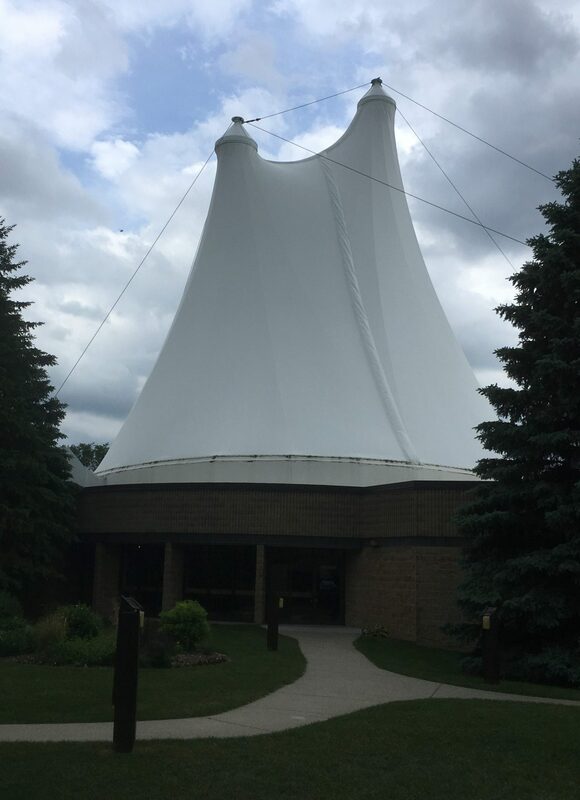 Of course, this center isn’t only for the solo-traveler, so bring your friends, bring your children, and come explore Moorhead’s Hjemkomst Center. You’ll always be velkommen! You look kind of like a Viking yourself! !